This post is meant to help beginning students listen for, and understand, the technique names we hear in class (especially those on our 6th Kyu exam), and to give those names a little context. “Katate-dori shihonage omote” can sound a little overwhelming if you don’t know how to break it down! Please don’t rely on anything in this post as information about what’s on the test, or about how to do anything. 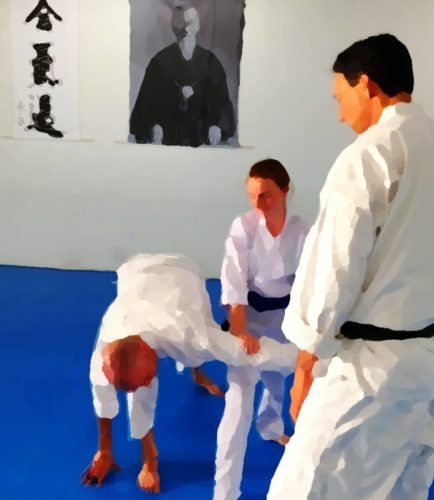 You can find our actual test requirements in the Aikido of San Diego Dojo Handbook. If you train at another dojo, a lot of this may be helpful, but your test will likely not include the same set of techniques, and some dojo have other names for these things. So use this as a starting point for learning to listen for the words used in your own dojo. At this point I’m going to keep it simple and stick to only what I hear them called in daily training. You will see various spellings and ways of writing these words. I’m using hyphens here to make the parts of the words more obvious (like mune-tsuki), but you will often everything run together (munetsuki). There are really only three things we do most of the time; we grab, we strike, and we punch. So we have only three core words to deal with. Each one has some additional words we use for specific cases, but basically there are three words for attacks: dori, uchi, and tsuki. A grab. We grab lots of things in lots of ways. Straight and cross-hand, grabbing one or both wrists, grabbing with one or both hands, and grabbing from the front, or behind Nage’s back. Luckily there is only one grab name you need to know for your test, the straight-across (not cross-hand) wrist grab, katate-dori. We’ll do more grab words in another post! Shomen-uchi [SHOW-men OO-chee] is a straight strike to the center of the head, at the forehead. Yokomen-uchi [yoh-KOH-men OO-chee] is an angled strike to the side of the head, at the temple or neck. Men means head, sho is center, and yoko means side. In open-hand techniques these strikes are done with the blade edge of the hand. You can also do shomen-uchi and yokomen-uchi with the bokken and jo. Shomen means the center of the head. You will also hear it in the context of “the shomen,” which is the place at the front-center of the dojo where the picture of O-Sensei is. A thrust or punch. Not something you have to know for the 6th kyu exam, but you’ll hear it in class. The punch we do most in class is mune-tsuki [moo-NET-skee], a punch to about the solar plexus, where the ribs and belly meet. Lots of other kinds of punches to leave for later. Most techniques have several variations. Some have inside and outside versions. At least one I can think of has four directions (more on that later). Many have a front or rear version. Front is omote, and rear is ura. These are easy to remember because omote/front are longer words, and both have a “t” in them, and ura/rear are shorter, and both have an “r” in them. Front. Notice when your partner is standing in hanmi (the basic stance in Aikido) that even though they are facing you their hips and body are oriented more to one side. That’s their front, or omote side. When you do the omote version of a technique you begin by entering to the front side of your partner (more or less). Rear. Their backside. The side with the shoulder blades, hindquarters, heels, etc. When you do the ura version of a technique you begin by entering to the rear side of your partner (more or less). On the 6th kyu test there are two techniques (ikkyo and shihonage) where you will be demonstrating both the omote and ura versions. Technique names ending in …kyo [kyoh] are pinning techniques. You’ll hear these names on the mat: ikkyo, nikkyo, sankyo, yonkyo, and gokyo. They are all pinning techniques. If you take off the …kyo part, you end up with roughly counting to 5 in Japanese: ichi, ni, san, yon,* go. (Four is also sometimes “shi.” We’ll get to that.) So they are pinning techniques one through five. Simple, huh? You’ll see the same counting pattern later, in weapons techniques. The only one on the 6th kyu test is ikkyo (both the omote and ura versions). Remember that four is sometimes yon, and sometimes shi. The 6th kyu test includes the technique called shihonage (both the omote and ura versions). Shiho means four-direction and nage means throw. So, Getting Back to "Katate-dori shihonage omote"
The complete names we use on the mat carry a lot of information, but they really are simple. The patterns is attack (where & how) > technique (description & type) > variation. So katate-dori is the attack, shihonage is the technique, and omote is the variation. Cool, right? Breaking it down further, we know that dori is one of the three kinds of attacks: a grab. Katate is straight-across to one wrist. So the attack, katate-dori is a one-handed, straight-across grab to the wrist. Awesome. Next? The variation is omote, or front. So the entry for this technique goes to the front of our partner. How will your partner attack? Will it be a grab (dori), strike (uchi), or punch (tsuki)? So, what kind of technique is this? Ikkyo, sure. So it’s a kind of technique that involves what? It’s not a throw (that would be -nage)… It’s a _____ing technique. And a hint: There are five of them. Which one is this? #_____. OK, here’s the whole answer: Shomen-uchi is an attack the front-center of the head. Ikkyo is the first pinning technique. The entry is to the rear of your partner. Try this with more technique names you hear in class! Ukemi is what you do when you are Uke [OO-kay]. (The other person is Nage [NAH-gay]. Ukemi includes providing the attack your partner needs so they can practice a technique, and then safely receiving the throw, pin, or whatever they do in response to your attack. The ukemi skills on the 6th kyu exam are forward and backward rolls. Technique. You will hear this in a lot more contexts, but in day-to-day training we mostly use it for freestyle, or free technique, called jiyu-waza [GEE-yoo WAH-zuh], and for techniques done from the kneeling position (seiza [SAY-zuh]), called suwari-waza [su-WAR-ee WAH-zuh]. These are the entering and turning movements we do at the beginning of most classes, and they are part of most techniques. Here are some tricks for remembering the words: Tenkan (with a “t”) involves turning (with a “t”). Irimi, at least to me, sounds like “excuse me,” and looks like what you would do if you were sliding past someone in a row of theater seats or a narrow hallway. This is the seated (in seiza) exercise we do at the end of many classes, where your partner grabs your wrists (usually, but not always, both wrists), and you tip them sideways. Kokyu, to the best of my understanding, refers to breath or breathing, and dosa is an exercise (as opposed to a technique). I’m afraid I’m no help at all on this one, and I forget the words every time I try to describe this. It’s the blending exercise we often do at the start of class, where your partner grabs one wrist (katate-dori again! ), and you enter and blend with their energy by stepping and turning (tenkan) alongside them. If you think of a good way to remember the name of this, let me know! Whew! That seems like a lot for what looks like a very short test, but because it’s all new there’s a lot to learn. I hope this helps you notice and understand these words when you hear them in class. As always, you can always go back and read all of my Aikido Words posts any time you like (the list will continue to grow). If you read my blog here at grabmywrist.com (as opposed to on AikiWeb) you may have see this mention in the left-hand column: “Any inept or incorrect information is my own responsibility, and should not be a reflection on others. ” This is one of those times. Tonight in class we did a very familiar technique that we’ve done dozens of times: iriminage. It wasn’t until I heard the name tonight that the lightbulb flickered on, and I realized the familiar technique and the new one I’d never seen before are the same thing. The version we usually have done involves (roughly – not complete instructions here…) taking Uke off balance and into you while turning, and then stepping into them to put them into a backfall. The “new” one involved taking them nearly to the mat in a descending turn, so they have to catch themselves with a hand to keep from going down completely, and then releasing them a bit, and as they pop back up (as Tissier does) stepping into them to put them into a backfall. I can’t resist sharing this video. This is the technique we worked on tonight in class. First time I’d seen it “live”, as best I can recall*. Our versions were a little less dramatic, but still fun to do. Watching this reminds me all over again how excited I am that I’ll be participating in a seminar with Tissier Shihan next month. He has been practicing Aikido since the same year I was born. I am not a young ‘un. It’s hard to imagine the level of expertise one could develop in Aikido, or anything, by practicing it for my entire lifetime. *Please see another post, updating this statement: “Iriminage – A Duh Moment”. This has been a very busy running-full-out kind of week at work. For some it’s been a pretty rough time. Everyone was quite ready to get started on the weekend this afternoon. For me it’s been mostly fun – the kind of work I enjoy, just lots of it, on tight deadlines. My body has had enough of sitting at a desk and using a trackball, even though I did get out for a quick walk at lunch. My brain could use a cooling-off period, too. Thankfully, I got to a good stopping point, and even entered my time for the week, before shooting out the door at 5:00. I managed to pop a temporary crown off a molar today. At 5:10 p.m. On a Friday. While driving in heavy traffic. On my way to the dojo. That’s always the best time for that sort of thing, you know. D’oh! Naturally I just stuck it back on, smooshed it down real good, and went on to class. Now I’m being very, very careful when I eat. Great. Tonight’s class was a lovely respite from the madness. (I just looked up “respite” on Dictionary.com to be sure I am using it correctly. I am. “a delay or cessation for a time, esp. of anything distressing or trying; an interval of relief.”) I got there early enough for plenty of warming up and stretching, and for the meditation period. When class started we did a lot of very soft rolling exercises, and then one putting each other into a forward roll, and being aware of where the connection and center was. Lots of attentiveness to keeping alignment and integrity. It was a pretty meditative, mindful sort of class. In spite of all that, it was physically a difficult class. My left upper-back/shoulder have hurt for 2 weeks, so rolling on that side (well, for the first 10 or so times each day), or breathing deeply, both feel a little like I’ve gotten the wind knocked out of me. Before class even started my left hip and right knee were unhappy (sitting for meditation didn’t help). To warm up before class I started to jump up and down a few times, and my ankle immediately hurt. One partner missed my arm doing ikkyo, and poked me right between the eyes. I almost got stepped on about 4 times, but the key word there is “almost.” Since actually getting stepped on twice this month (once on each foot) I’ve been more careful about that, and got my feet out of the way this time. And I have a few new bruises. No real harm done (although my knee worries me a bit – it’s an ongoing thing). Hooray for Arnica gel and ice packs. I’ve been noticing the same thing in class, that I may not have a whole technique down, but I get some aspect of it right, or even if it’s not perfect, the overall thing flows a little more smoothly. Trending in the right direction is a good thing. I’ll take it. Class ended on a more-contemplative-than-usual note, with Sensei reminding us that Aikido is not about attacking and defending, not me and you, but about the shared energy between partners. Good thoughts to take us into the weekend. Day 14 of 16. Today at work was harsh. Plowed through work all day long, and then an hour before I had to leave, I realized there was a huge chunk more that had to be done. If my day were randori, I’d let myself end up in the middle, and all the attackers were on me. I haven’t been out walking for 2 days, and my legs felt like achy blocks of concrete. My left shoulder has been bugging me, so I was icing it at my desk. I wouldn’t have gone to class, except that I said I was going to. I didn’t figure my brain could absorb a lot more today. I was tired and overwhelmed, and really feeling the need for rest. That all vanished after a minute or two on the mat. Everyone was in a wonderful mood. I had plenty of time to warm up. My front and back rolls were better tonight. I got most of the techniques at least halfway correct. I felt focused and centered, and had a very pleasant time in class. Yay! Tonight was a weapons class with Sensei. We did tanto, which I think I’ve only worked with once or twice before. Even techniques that sometimes turn my mind into a pretzel seemed easier. I was gonna go to class anyway, because I said I would, but now I’m really glad I did. Off to dinner and a quiet evening, with more energy that I’m going to need for another intense day at the office tomorrow. I sure didn’t get everything perfect today, but I did a lot better. 5-½ hours of sleep instead of 4, and actual meals (big, hearty salads), meant more energy. Last night’s bath, plus a few sessions with ice packs, had everything feeling better today. More water, less coffee, more focused. Not perfect… Still not enough sleep. I didn’t eat or drink enough this afternoon. Having a good dinner now, with ice packs scattered about as needed, and heading for bed ASAP. I’m glad I seem to be able to get things going in the right direction, instead of getting more sore, and more tired. Tonight (day 6 of 16) there were two classes, so I did them both – 2 hours, total. It’s the first time I’ve trained on a Wednesday, because I usually have another commitment in the evening. So these classes were new ones for me. The first class (open to all students) was the biggest class I’ve done, aside from the Nadeau seminar in July. The second class is “only” open to 6 kyu and above. (I’m 6th kyu – that’s the level where you’ve proven some very basic competence at simple things – graduated from kindergarten, essentially.) There really is no set pattern to how classes are run, aside from warm-ups, but this week in particular, with a variety of yudansha teaching while Sensei is on vacation, they are even more variable. It’s great to hear things explained in different ways, do new exercises and techniques, and experience a little different temperament to each class. I finally learned something that has been driving me nuts for months. I’ve seen the ukemi for tai no henko done two ways – staying rooted where you are, basically, or sort of spinning to face Nage (and keep your own alignment). I failed to see the pattern to when it was done one way versus the other. It seemed capricious. I’d almost accepted it as a koan of sorts – someday it would become clear to me why each way was randomly wrong half the time. (I suppose I should have, um… asked?) At any rate, someone (and I’ve very sorry that I can’t remember who) pointed out that the difference is static practice (kihon waza?) versus doing the whole thing in-motion. Oh! Something I was especially aware of this evening, although it’s always the case, was the attention to detail, kindness, patience, and generosity of spirit of everyone I have the privilege of working with. Everyone is careful with their partners, thoughtful in giving perceptive, helpful feedback, and really warm and caring about each other. (And I’m not just saying that because I know some them read my blog. Really.) It’s a wonderful environment to practice and play in. I found out today that yet another student will be signing up for the Aikido Bridge seminar. So that makes at least 4 of us from Aikido of San Diego who are going. Yay! For the last couple of days the muscles under my left shoulder blade have been in spasm. Patient trigger point work last night and this morning helped, but even so, by the time I got to the dojo it was the sort of thing that made me not want to even take a deep breath. I considered not going to class, but I’m too stubborn to wimp out. Fortunately, like last Friday, a good workout with a lot of rolling got it feeling nearly perfect. Much, much better. (Domo arigato gozaimashita. You know who you are.) By some great stroke of luck, I was also able to schedule a massage today for Saturday afternoon. Really looking forward to that! We had the opportunity to try a two-uke jiyuwaza (randori?) at the end of the second class. I would have loved to done it (in either role), but I was just too exhausted and dehydrated (in spite of drinking water all through class) to do anything else. I hope we have the chance again, when I’m not wiped out. All in all, a tremendously fun evening. I left the dojo already looking forward to tomorrow night. But for now, a hot shower and sleep. I’m just back from this morning’s seminar on Connection, and things are only just starting to sink in. So I’m sure I’ll have more thoughts (or feelings?) on this eventually. But here are a few things that stood out for me at first glance. We did an exercise where we did shomenuchi ikkyo, ura waza, but without touching each other. Just staying together through the technique in a sort of magnetic way. It was pretty easy and slow at first, and as Nage it felt a bit like operating a marionette (a puppet operated at a distance by strings). But then we switched partners and I was working with someone doing it quite a bit faster. And I, when I was Uke, had to keep up! It required a lot more alertness, and willingness to actively move with Nage’s direction. He’d spiral backward and downward quite fast (it seemed), and I had to move to stay with him. A strange experience, throwing oneself! A little light went on there. I have been relying on Nage to physically move me through techniques. Not actively resisting, but not actively extending into the technique, either. Shutting down. Being done unto. Later, while doing kotegaeshi, I injured the back of my hand – I think by getting behind Nage’s motion, instead of staying with him. No biggie, but it blew up a little, so I sat out for a while to do the ice, pressure, & elevation thing. It gave me a chance to watch and let things sink in. Everyone was working on a reversal technique, and exploring the idea that staying connected and active is what lets you be (as Uke) in a position to do the reversal. It occurred to me that staying actively engaged and connected, instead of shutting down and being done unto, is one of the things missing in my riding. I already knew this on one level – that I tend to shut down when “things get a little Western.” It’s one of the specific things I came to Aikido to work on. Today’s work gave me a slightly different perspective on it. I’ve been thinking in terms of “don’t shut down.” But that doesn’t give me anywhere to go. “Not shutting down” is hard thing to do – because it’s a negative. (Go ahead and try not shutting down.) One of the things I know in horse training is that you can’t train a horse to not do something. You have to train it to do something else that is incompatible with the undesirable behavior. Something like “lower your head in response to rein pressure” is trainable, where “don’t toss your head” isn’t. The head lowering precludes head tossing. I’d even thought, in my things I want to get out of Aikido, as far as “be able to take effective action in the face of overwhelming physical threat” (like when your 1,400 lb horse is bucking across an open meadow). But that’s hard to do, too, because it’s too vague. Or maybe it a consequence of something. There’s a step missing. “Stay connected with your partner,” on the other hand, is something specific one can do. It’s specific and immediate (or ongoing, actually). It naturally precludes shutting down and being done unto. So there’s something I can work on. Staying connected with my horse. Going from “being bucked with” to “back in control” is a reversal of sorts, one that connection makes possible.